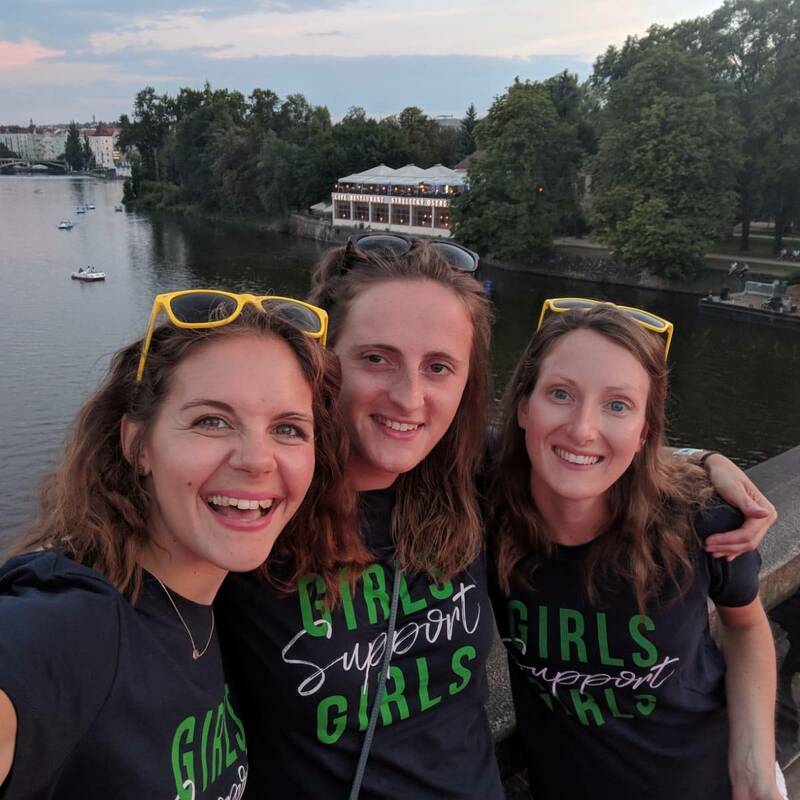 When I moved away from London in December I was worried I wouldn’t see my best girlfriends Sophie and Steph, so instead of giving each other Christmas gifts we bought flights to Prague where Sophie was racing and Steph and I would go along for the ride/support. 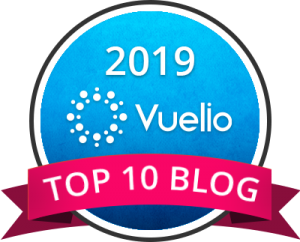 July came around so quickly and although we’d seen each other between then and now, it was nice to have something in the diary to look forward to, especially as Prague was a city none of us had visited before and we could explore and learn about it together. The race was Challenge Prague – an international triathlon race that took part in the historical centre of the Czech Republic’s capital city – and with Sophie signed up to the middle distance and Steph signing up to the TRY-athlon just a few weeks before race day, I was on chief cheer duty on Saturday. 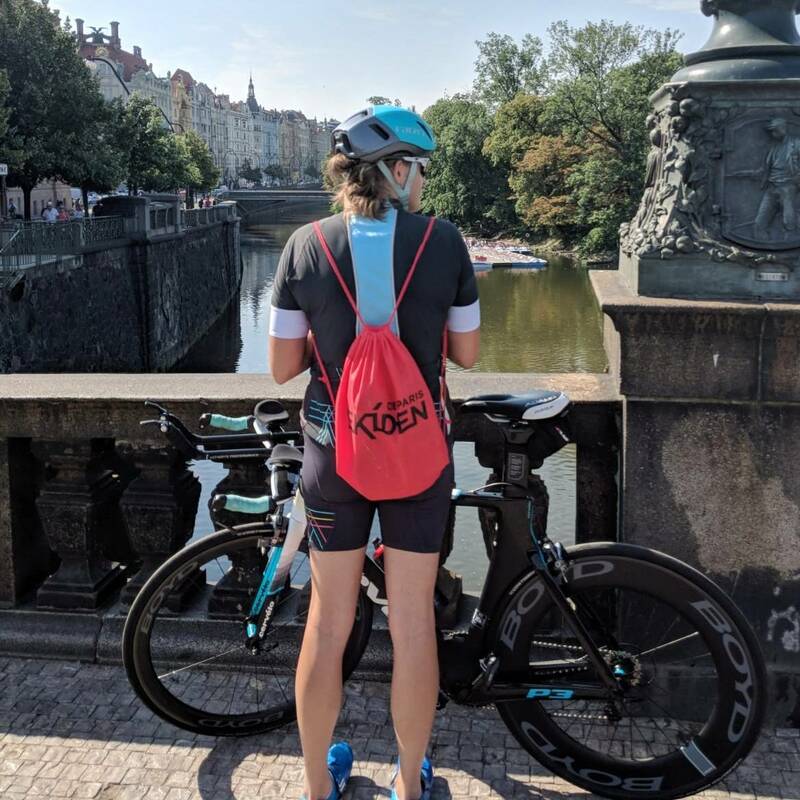 We arrived in Prague on Thursday morning and the first thing I learnt about travelling with a group of triathletes was that they come with baggage. More precisely, a large bike box each. After two bikes didn’t make it on the plane in Heathrow and then the taxi we’d ordered couldn’t fit us all plus bike boxes in it, we somehow made it to our airbnb in one piece including the bikes. Bike assembly is also something that you have to fit into your schedule ahead of race day and the girls were quick to it, building their bikes and checking all was in order. Because of the hot weather and non-air-conditioned apartment, they were careful not to pump up the tyres too much in case they exploded! Next up on the Friday, after Steph and I tested out part of her route on a run and the girls took their bikes out for a quick spin, was a visit to the expo to collect race numbers and all associated race kit – mainly drop bags for each transition. Here we also checked out the main sponsors and I even managed to bag 40% off a new pair of Stance socks. We then headed to test the water, quite literally, at the swim practice, where all competitors (and me!) had an hour to check out the water temperature and current of the river where they would be racing the following day. In my swimming costume I found the temperature quite cooling, especially as it was over 30C on land, but 17C river temperatures was too chilly for most competitors and they decided it would be a wetsuit swim. Preparations in place it was the last supper – a homemade dinner picnic – and an attempt to get a good rest ahead of the race. Steph’s race started at 8.30am on Saturday whereas Sophie had a 12.05pm start, so I had to be ready and raring to go for both my girls. I made slogan banners before bed and packed my bag with water, snacks, suncream, phone, money and keys, before trying to get an early night too. On Saturday, Steph and I woke early, had coffee and walked down to the start for just after 7am. She racked her bike and dropped bags at the transitions, before we sat down in the shade and I braided her hair for the race. At 8.10am she wiggled into her wetsuit, oiling herself and it up, popped her swimming caps and goggles on, made sure her watch and race chip were on and made her way to the edge of the river for the start with the others. 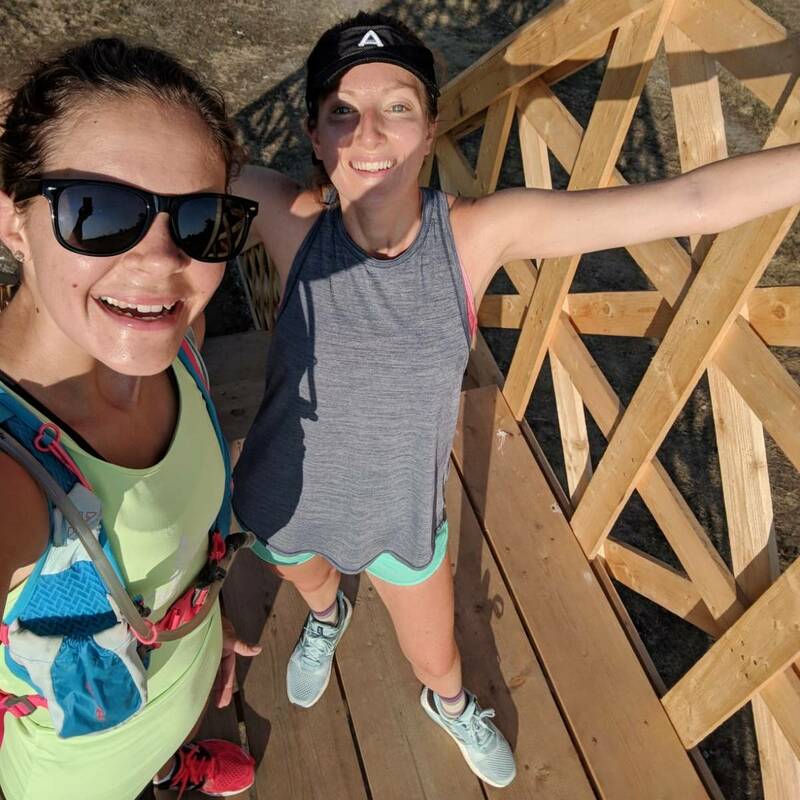 For only her second triathlon, the first just last weekend, she underestimated her power in the swim moving quickly through the field from the back of the pack to race through transition and move comfortably onto the bike. The four laps of the cycle route was tough with sharp U-turns and it tested Steph’s confidence, but she rightly put safety over speed and wheeled into T2 grinning. The run section is Steph’s forte and she raced through the field picking runners off over the 4km sprint to the finish, jumping over the line and achieving so much in such a short but steep learning curve. 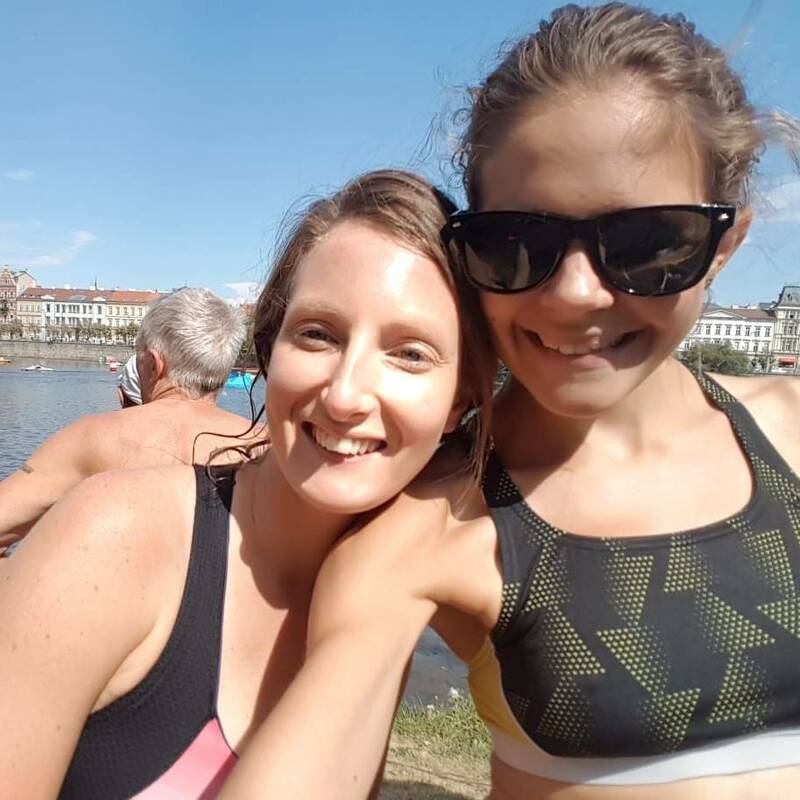 Completing two triathlons, one international, in two weeks, would’ve been unthinkable this time last year, as she learnt to swim and ride a bike. What she achieved is simply incredible. Onto the middle-distance race and Sophie and the Berkshire Triathlon Squad (Steph’s club) were up. First to go were the pro men, followed by the pro women, all the age-group women together – including Sophie – and finally each of the men’s age groups. After a moment of panic with Sophie’s wetsuit – luckily saved by BTS girls – we watched her go into the water then dashed around the island to see the swimmers pass, guided by volunteers on kayaks. We raced up the steps onto the bridge to see Sophie catch and pass some of the pro women ahead of her. She was swimming strong. 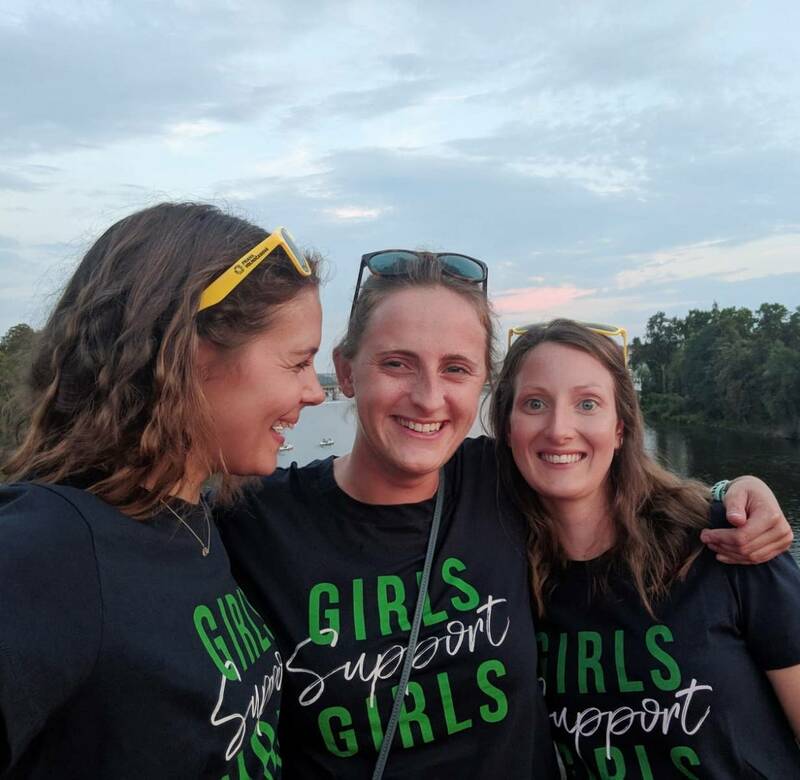 Just as Steph’s race has done, the swimmers jumped out of the water, ran along the red carpet and up the steps onto the bridge, took off their wetsuits and got ready for the cycle stage. We were standing right by T1 as they ran through and mounted their bikes, some running in cleats while others ran barefoot, their shoes attached to their pedals and cleverly held upright with elastic bands. We watched as each person we knew raced through T1 before heading off for a break while they cycled. 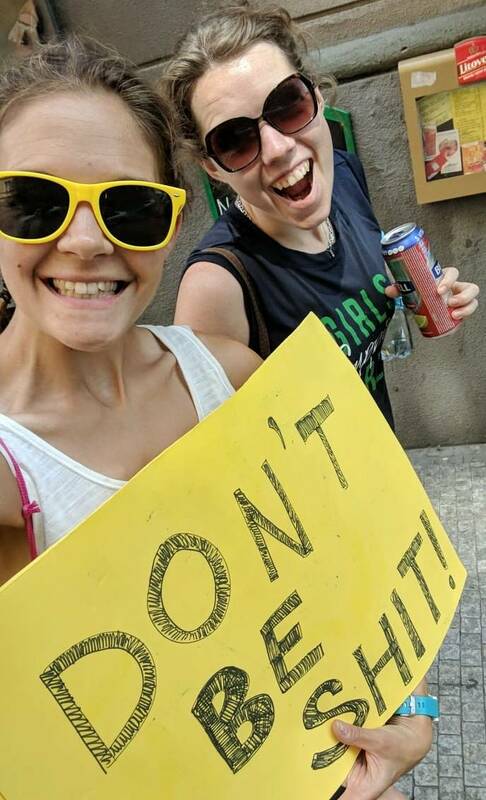 They had 90km to complete with two laps, and with the turn over a mile away we left them too it, knowing we’d see them four times on the run stage later. 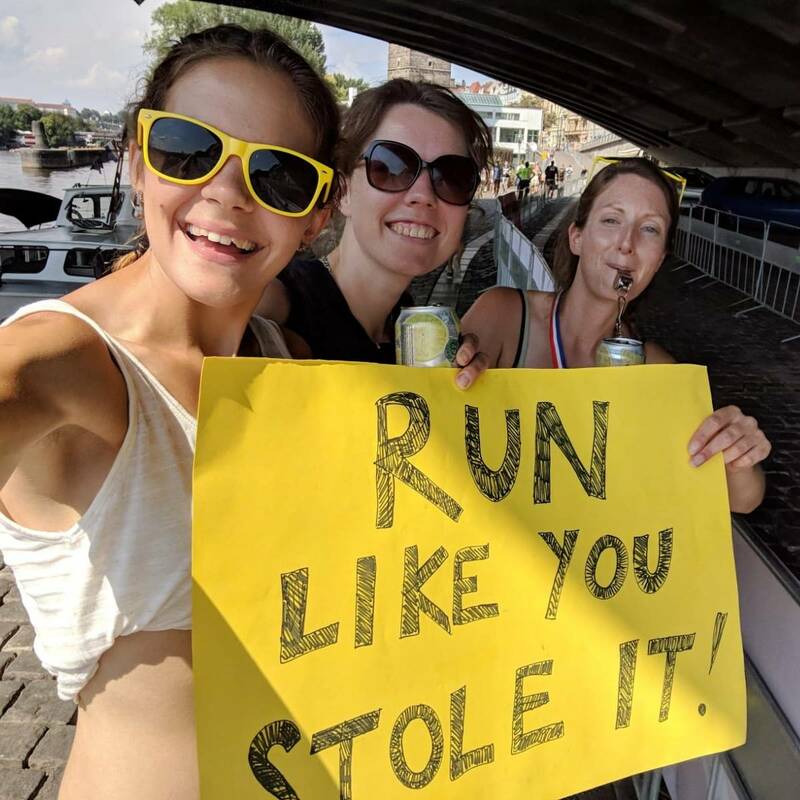 We set up our cheer station – signs, bells and whistles – about a kilometre into the 5km run loop, in the shade of a tunnel and looked at the online race tracker to see who would be running down the cobbles off the bike first. Organisers on bikes led the first, second and third pro men and women in the run and we cheered on tired, hot and sweaty runners as they passed. 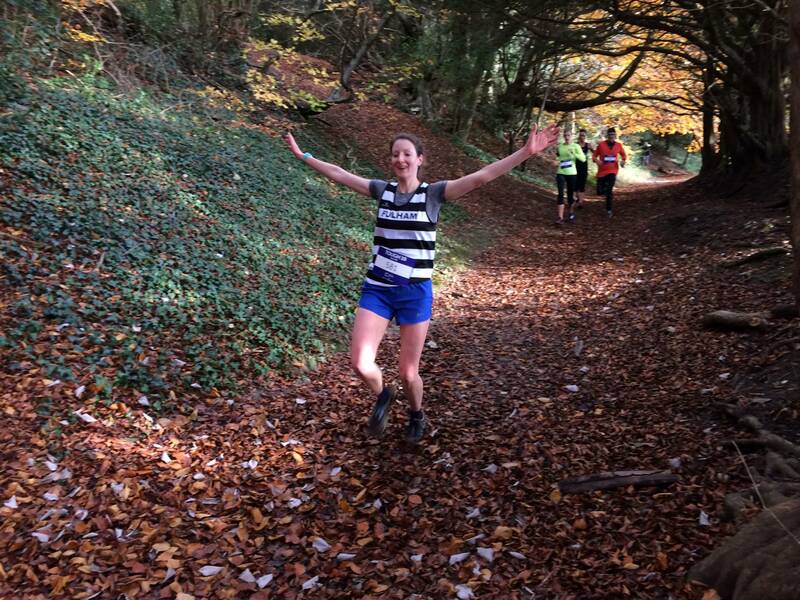 As we spotted Sophie running down the slight hill and she got closer it was clear she was having a tough time, it hadn’t been her day and she sensibly pulled out after one lap and walked in to the finish with us, cheering as we followed the field. We set up again just ahead of the finish line to cheer everyone through and watch them run over that final red carpet to collect their well deserved medals. I think I underestimated the endurance and grit of the competitors taking on the challenge of this event, as broken athletes slumped over the finish line after giving it all in each of the swim, bike and run sections. They had nothing left and I applauded them for their incredible efforts. 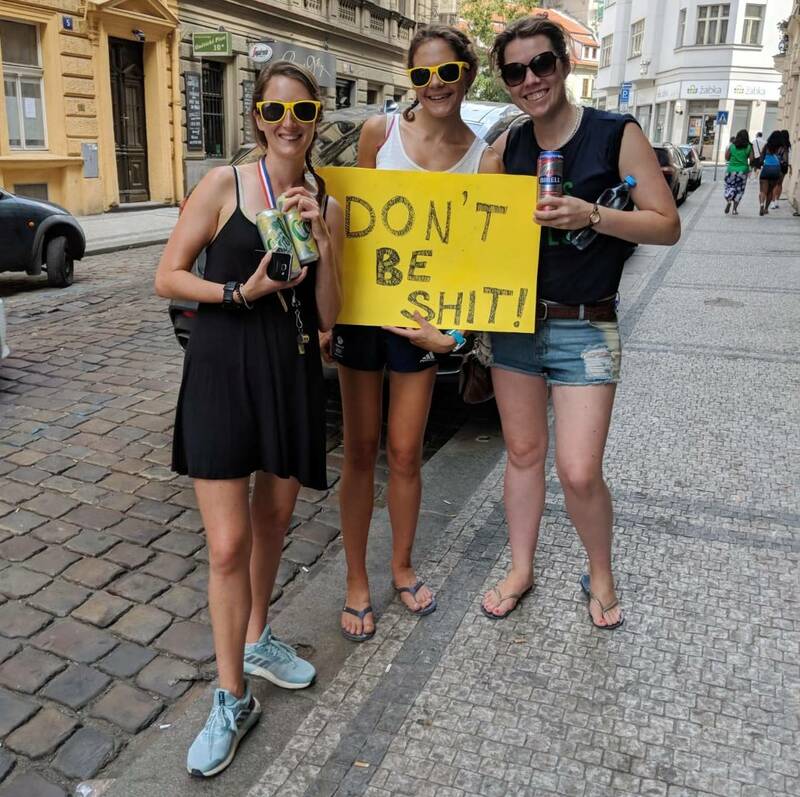 A huge congratulations to each and every one of the Challenge Prague competitors this weekend, you are all amazing and I hope our cheers of support pushed you that little bit further towards that finish line. I love supporting at events like these and would recommend getting out to watch an event unfold, hold a slogan sign up high, ring a cowbell loud and scream words of encouragement at these incredible endurance athletes.